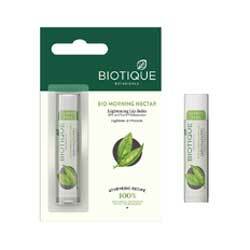 Biotique Bio Morning Nectar Lightening Lip Balm SPF 30 - Anti aging balm moisturizes and revitalizes lips. This anti-aging balm moisturizes and revitalizes lips. Fights collagen loss and fills-in creases to smooth-out dry lines for noticeably smoother, younger looking lips.